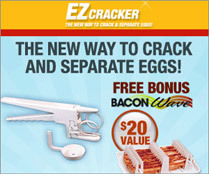 Summary: The new way to crack and separate eggs! Strip shells from hard boiled eggs in seconds. No mess, no fuss. The new way to crack and separate eggs! Strip shells from hard boiled eggs in seconds. No mess, no fuss. EzCracker separates egg whites for perfect egg white omelets too. Get a free BaconWave with your purchase. Here's how easy it is to use the EZCracker! Simply insert an egg into the EZ Cracker. Squeeze EZ Cracker to perfectly crack the egg. Cook and enjoy a delicious shell-free breakfast!